Xamarin.Android ProGuard is a Java class file shrinker, optimizer, and pre-verifier. It detects and removes unused code, analyzes and optimizes bytecode. This guide explains how ProGuard works, how to enable it in your project, and how to configure it. It also provides several examples of ProGuard configurations. ProGuard detects and removes unused classes, fields, methods, and attributes from your packaged application. It can even do the same for referenced libraries (this can help you avoid the 64k reference limit). The ProGuard tool from the Android SDK will also optimize bytecode and remove unused code instructions. ProGuard reads input jars and then shrinks, optimizes, and pre-verifies them; it writes the results to one or more output jars. Shrinking step – ProGuard recursively determines which classes and class members are used. All other classes and class members are discarded. Optimization step – ProGuard further optimizes the code. Among other optimizations, classes and methods that are not entry points can be made private, static, or final, unused parameters can be removed, and some methods may be inlined. Obfuscation step – In native Android development, ProGuard renames classes and class members that are not entry points. Retaining entry points ensures that they can still be accessed by their original names. However, this step is not supported by Xamarin.Android because the app is compiled down to Intermediate Language (IL). Preverification step – Performs checks on Java bytecodes ahead of runtime and annotates class files for the benefit of the Java VM. This is the only step that doesn't have to know the entry points. Each of these steps is optional. As will be explained in the next section, Xamarin.Android ProGuard uses only a subset of these steps. Each of these steps is described next. Which assemblies are actually used. Which types are actually used. Which members are actually used. After the linker step completes successfully, ProGuard is run to remove unused Java bytecode. This is the step that optimizes the APK. To use ProGuard in your app project, you must first enable ProGuard. Next, you can either let the Xamarin.Android build process use a default ProGuard configuration file, or you can create your own custom configuration file for ProGuard to use. For most Xamarin.Android apps, the default ProGuard configuration file supplied by Xamarin.Android will be sufficient to remove all (and only) unused code. 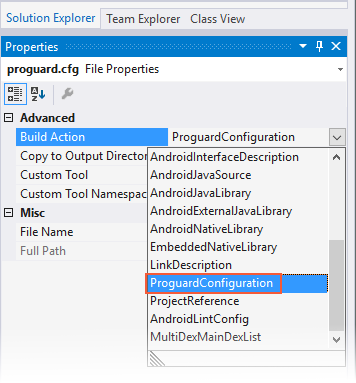 To view the default ProGuard configuration, open the file at obj\Release\proguard\proguard_xamarin.cfg. The next section describes how to create a customized ProGuard configuration file. Keep in mind that this configuration file does not replace the Xamarin.Android proguard_xamarin.cfg file since both are used by ProGuard. # This is Xamarin-specific (and enhanced) configuration. # hash for android.runtime and assembly_mono_android.android.runtime. In this example, MyClass is set to the actual name of the class that you want ProGuard to skip. You can also register your own names with [Register] annotations and use these names to customize ProGuard rules. You can register names for Adapters, Views, BroadcastReceivers, Services, ContentProviders, Activities, and Fragments. For more information about using the [Register] custom attribute, see Working with JNI. ProGuard offers a number of options that you can configure to provide finer control over its operation. The ProGuard Manual provides complete reference documentation for the use of ProGuard. If you are trying to use ProGuard against Android 7.0 or later, you must download a newer version of ProGuard because the Android SDK does not ship a new version that is compatible with JDK 1.8. You can use this NuGet package to install a newer version of proguard.jar. 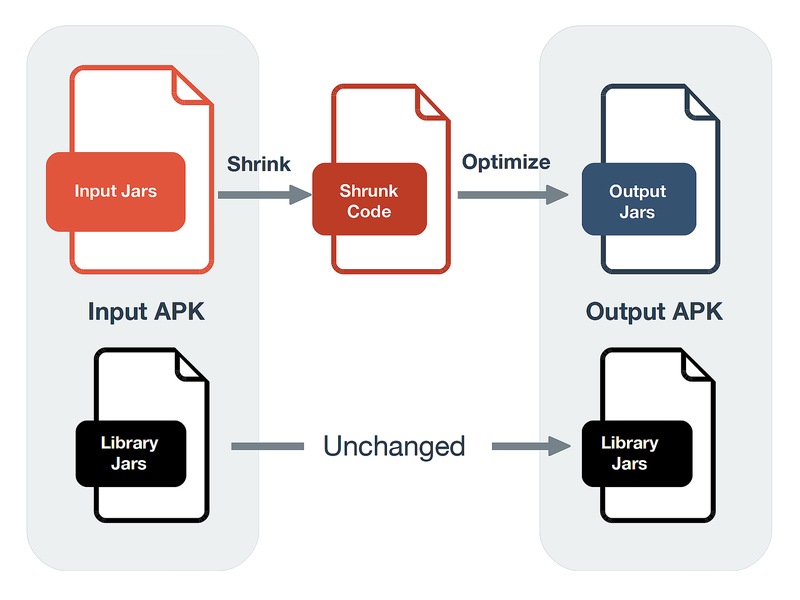 For more information about updating the default Android SDK proguard.jar, see this Stack Overflow discussion. You can find all versions of ProGuard at the SourceForge page. Two example ProGuard configuration files are listed below. Please note that, in these cases, the Xamarin.Android build process will supply the input, output, and library jars. Thus, you can focus on other options like -keep. The following sections explain how ProGuard runs during a Xamarin.Android Release build. What command is ProGuard running? The ProGuard task is found inside the Xamarin.Android.Build.Tasks.dll assembly. It is part of the _CompileToDalvikWithDx target, which is a part of the _CompileDex target. This issue typically happens on Windows because the .cfg file has the wrong encoding. ProGuard cannot handle byte order mark (BOM) which may be present in text files. If a BOM is present, then ProGuard will exit with the above error. To prevent this problem, edit the custom configuration file from a text editor that will allow the file to be saved without a BOM. To solve this problem, ensure that your text editor has its encoding set to UTF-8. For example, the text editor Notepad++ can save files without the BOM by selecting the Encoding > Encode in UTF-8 Without BOM when saving the file. To prevent this problem, save your custom configuration file from a text editor that allows you to omit the BOM. The ProGuard Troubleshooting page discusses common issues you may encounter (and solutions) when using ProGuard. This guide explained how ProGuard works in Xamarin.Android, how to enable it in your app project, and how to configure it. It provided example ProGuard configurations, and it described solutions to common problems. For more information about the ProGuard tool and Android, see Shrink Your Code and Resources.